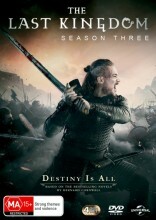 The Last Kingdom Season 3 DVD in the year is 872, and many of the separate kingdoms of what we now know as England have fallen to the invading Danes, leaving the great kingdom of Wessex standing alone and defiant under the command of King Alfred. Time is running out for King Alfred (David Dawson) to unite the kingdoms. With his health failing and the line of succession uncertain, Alfred looks to our hero Uhtred (Alexander Dreymon) to ensure his young son Edward (Timothy Innes) becomes the next king. Meanwhile, dark forces are moving outside the court and when a powerful Danish warlord Bloodhair (Ola Rapace) attacks, Uhtred must lead Wessex's forces into battle. Uhtred captures Bloodhair's mysterious lover, the savage sorceress Skade (Thea Sofie Loch Noess), who throws a curse and his world becomes blighted by tragedy. In this dangerous time of treachery and chaos, Uhtred is caught between enemies both Dane and Saxon and confronts a difficult choice--is he deserts Alfred's cause, the future of the English people will be changed forever. We love this show, couldn’t stop binge watching. When is next season coming. Great almost Game of throne like series. Click the button below to add the The Last Kingdom - Complete Season 3 to your wish list.